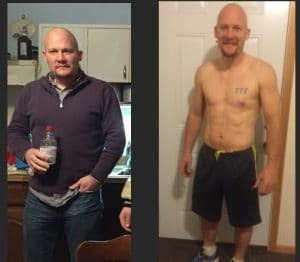 I created this workout to help motivate me (and other fire rescue athletes) to stay in shape. 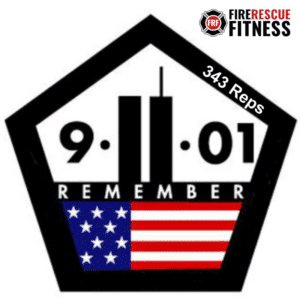 I encourage you to do this workout, share your results and challenge others to do the same, at least once a year (on September 11th). 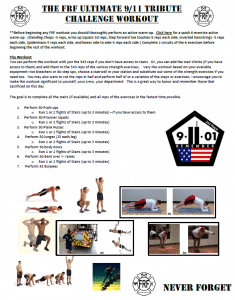 This “tribute” workout is difficult but has a great significance to September 11th. There are previous versions of the workout, you can see them by clicking here. This workout challenges you to run stairs and complete 343 reps of various strength exercises. You can perform this workout with just the 343 reps if you don’t have access to stairs. Or, you can add the stair climbs (if you have access to them) and perform 343 reps of various strength exercises. Perform for each exercise for the prescribed number of reps with no rest between exercises for 2 circuits. Now that your body is properly “primed”…its on to the workout. All you need for this workout are some steps (or a step-mill) and a way to do pull-ups or body rows. You should time the workout from the first step to the last so you can track your fitness progress from year to year. Variations: You can vary the workout based on your available equipment–run bleachers or do step ups, if you don’t have a step-mill or substitute out some of the strength exercises. You can run a stairway up and down or run it for 3 minutes. You may also want to cut the reps in half and perform half of or a variation of the steps. I encourage you to make the workout significant to yourself, your crew, your department. This is a great way to honor and remember those that sacrificed on this day. Perform all the reps of these exercises then run the stairs (1 or 2 flights) based on your level of fitness. If you don’t have stairs, you can substitute them out for a different exercise. The goal is to complete all the stairs and all reps of the exercises in the fastest time possible. Record your time…. then pass out (just kidding). Take a moment to understand the significance of the workout and to make a pledge (as a firefighter or as a person) to strive to improve your level of fitness (or at least maintain) from year to year.